Our Training and Experimentation in Computational Biology (TECBio): “Simulation and Visualization of Biological Systems at Multiple Scales” REU program is a 10-week summer program that will provide a challenging and fulfilling graduate-level research experience to undergraduate students. A wide variety of theoretical and experimental research projects are available to our participating students. Students will also receive classroom training in topics pertinent to the emerging field of computational biology, such as computational structural biology, cell and systems modeling, computational genomics, and bioimage informatics. 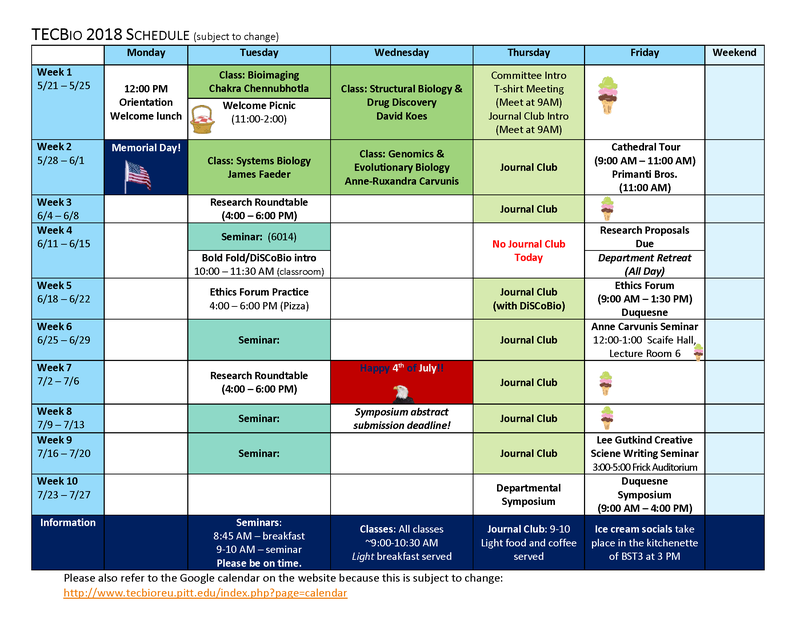 Additionally, TECBio students will participate in a weekly journal club, attend research and career seminars organized specifically for the program, take part in an ethics forum that will instruct them in the responsible conduct of research, present their work at a Pittsburgh-wide annual research symposium, and experience the various social and cultural activities available in Pittsburgh – America’s most livable city. Students will start their research immediately at the beginning of the TECBio program. Within the first two weeks, students will also attend lectures and participate in computer laboratory sessions that will give them exposure to and practical experience in a comprehensive and interdisciplinary breadth of topics. The final week will be devoted to student presentations. Weekly seminars and journal clubs will also be hosted. The TECBio REU @ Pitt Research and Career Seminar Series will host faculty and scientists from a wide variety of disciplines to present and discuss their work and career experiences. Students will have the opportunity to meet with each speaker over a breakfast held prior to each seminar and/or over coffee and pastries that will follow. Seminars are held at 9:00am (breakfast at 8:30) on Tuesdays, unless otherwise noted. Each student will give a ~20-25 minute presentation plus ~5 minutes for discussion of one research article during the Journal Club. The article (a primary research paper, no reviews please) will be selected with the help of the research mentor after discussing the student’s research interests and background. We ask that students arrange for a member of the research mentor’s group to attend the journal club to facilitate the presentations and discussions. For questions, please contact the Journal Club Coordinator, Ms. Kristina Buschur (klb170@pitt.edu). An Ethics Forum will be organized and hosted on July 20 by Duquesne University for summer students at Pitt, Duquesne, and the Pittsburgh Tissue Engineering Initiative. TECBio students will participate in this mentored team-based forum by presenting their views on a selected topic to other teams. Each summer all research program students at the University of Pittsburgh are invited to attend a Baseball Game and Fireworks Night at PNC Park. Other activities are also organized during the program.